↑ Neil Costley; Jo Fawcett. "General Dental Council Patient and Public Attitudes to Standards for Dental Professionals, Ethical Guidance and Use of the Term Doctor". General Dental Council/George Street Research. 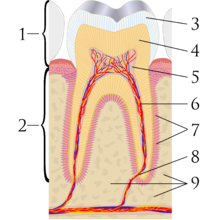 ↑ "Glossary of Dental Clinical and Administrative Terms". American Dental Association. http://www.ada.org/glossaryforprofessionals.aspx। আহৰণ কৰা হৈছে: 1 February 2014. ↑ "Stone age man used dentist drill". BBC News. 6 April 2006. http://news.bbc.co.uk/1/hi/sci/tech/4882968.stm। আহৰণ কৰা হৈছে: 24 May 2010. ↑ Suddick, RP; Harris, NO (1990). "Historical perspectives of oral biology: a series". Critical reviews in oral biology and medicine : an official publication of the American Association of Oral Biologists খণ্ড 1 (2): 135–51. doi:10.1177/10454411900010020301. PMID 2129621.